This week on Good Girls Get Rich, we are diving back to LinkedIn and talk about some misconceptions about it. 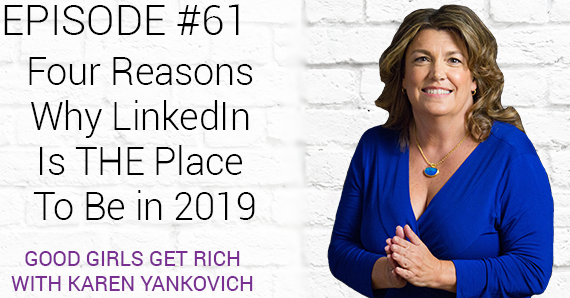 LinkedIn is still the most underutilized social media and with episodes like this, Karen hopes to inspire you to use LinkedIn as much as you use Facebook and Instagram. 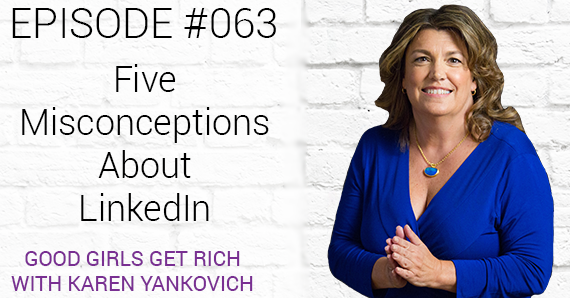 Listen and learn about Five Misconceptions about LinkedIn and what you can do about it. If you want to level up your game in LinkedIn, make sure to check out Karen’s FREE Video Series to help you get started. Registration for Marie Forleo’s B-school 2019 is now closed. Get notified and join the wait list when it opens again for 2020 here. 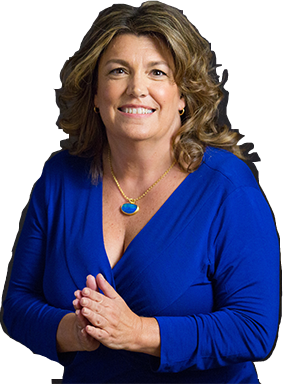 Check out Karen’s FREE Video Series that will help you get started your LinkedIn profile. This week, Good Girls Get Rich features guest Patty Lennon, a national speaker and author who inspires audiences to lead and sell with passion and purpose. She is an expert business coach who helps moms and women entrepreneurs grow their businesses. If you are looking to start your own entrepreneurial journey, this episode is definitely for you! In this episode, Karen and Patty talked about leaving the corporate world to be an entrepreneur. Being an entrepreneur is hard work. Listen as Karen and Patty share tips and strategies on how to be a successful entrepreneur – from starting the journey, selling your product or service to landing speaking engagements. This week on Good Girls Get Rich, Karen is driving back to her LinkedIn roots to discuss (and hopefully, convince you) that LinkedIn is the BEST PLACE to be in 2019. As you may already know, Karen is a massive LinkedIn geek and her business is heavily focused on helping entrepreneurs and business professionals to drive sales through LinkedIn. In this episode, Karen shares a lot of insights from tips and tricks to even facts and statistical figures. You can really hear and feel her excitement as she discusses these things! Listen and learn about building relationships on Twitter and then, closing the deal on LinkedIn. You’ll also learn about the new live video broadcast service called LinkedIn LIVE and all the other changes LinkedIn has been doing for the past year. Check out, yMarketingmatters by Yasmin Brendror – Karen and Yasmin met through Twitter which exhibits how you can actually build relationships via social media. This week on Good Girls Get Rich, Karen welcomes back our very first repeat guest, Marie Forleo. She is an entrepreneur, writer, philanthropist and unshakable optimist dedicated to helping you become the person you most want to be. She was named by Oprah as a thought leader for the next generation and in this episode, she shared her insights on the importance of relationships – building them and nurturing them. 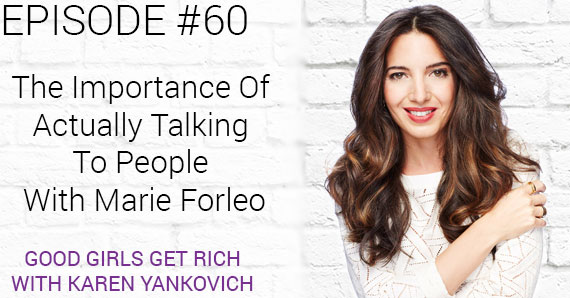 Listen and don’t forget to take notes as Karen and Marie discuss the impact of having that community around you. You’ll also get the chance to take a peek on Marie’s program, B-School, and how it has helped many people, including Karen, realize their greatest potential. You don’t want to miss this one! Watch Marie’s award winning FREE video series HERE – for a limited time only! Marie’s Book, Everything is Figureoutable, will be available in September 10, 2019. Pre-order yours now! 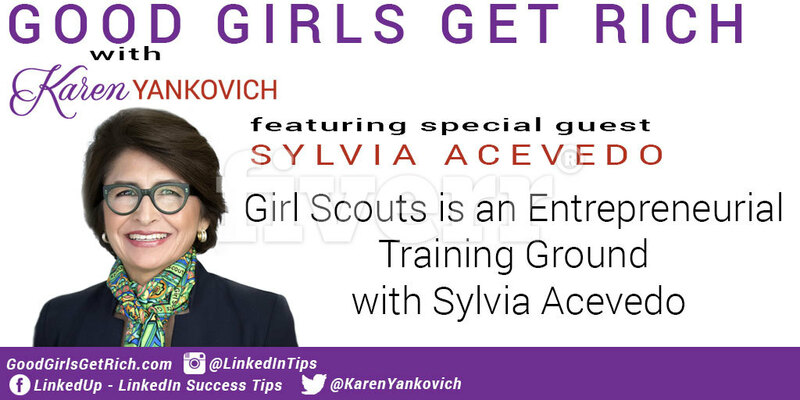 This week on Good Girls Get Rich, Karen sat down with Sylvia Acevedo, author, entrepreneur, engineer and Girl Scouts of America’s CEO, and talked about Sylvia’s journey from being a girl scout to a rocket scientist. Sylvia Acevedo is an award-winning entrepreneur who has earned worldwide recognition for her work in addressing one of society’s most vexing challenges. She holds a Master’s degree in Systems Engineering from Stanford University where she was one of the first Hispanics, male or female, to have earned a graduate engineering degree. Sylvia earned her Bachelor’s degree in Industrial Engineering from New Mexico State University. One day, upon reminiscing, she realized that the greatest inflection point in her life was the day she decided to be a girl scout. Listen and get inspired to do what you love and create your own path. Also, don’t forget to show your support to the younger girls by finding your local girl scouts and buy delicious cookies from them. Check out the official site of Girl Scouts of America – the preeminent leadership development organization for girls. Connect with the Girl Scouts of the USA on LinkedIn. Learn more about author, entrepreneur, engineer and Girl Scouts of America’s CEO, Sylvia Acevedo. Path to the Stars: My Journey from Girl Scout to Rocket Scientist – an inspiring memoir for young readers about a Latina rocket scientist whose early life was transformed by joining the Girl Scouts. Karen and Sylvia started their relationship through LinkedIn. Make a first great impression by building a high-quality LinkedIn profile. Learn more by listening to GGGR Episode 58: Your LinkedIn Profile – Bragging or Owning?